This recipe was originally posted on House of Yumm. I have spent a lot of time searching for recipes I can use over and over again for my meal prepping. I look for three things. #1 Recipes I WANT to eat again and again. #2 Recipes with a variety of nutrients. #3 Recipes that fill me up and don’t leave me wanting more. This recipe, my friends, from House of Yumm is one of those WINNERS! I make it at least once a month, and it really is a perfect addition to your fall repertoire. Bon Appetit! Add the spinach to a medium size bowl or plate. 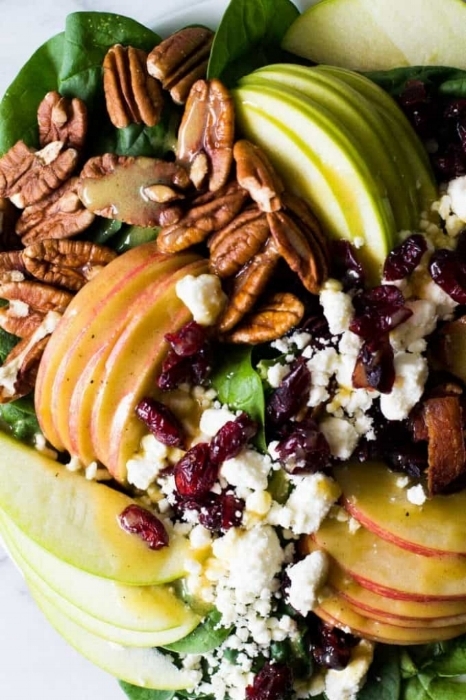 Top with dried cranberries, halved pecans, feta cheese, sliced apples, and cooked bacon. Add all the ingredients for the maple dijon vinaigrette to a small mason jar. Shake to mix. Pour over the salad. The dressing recipe makes enough for two salads. Leave out one of the fruits, the dried cranberries or the apple slices. I leave off the dried cranberries and account for the apple slices in my daily net carbs. I like to add another vegetable in its place. I personally add red onion. I also add additional protein, like a ½ chicken breast. Replace the maple syrup in the dressing with Swerve sweetener.